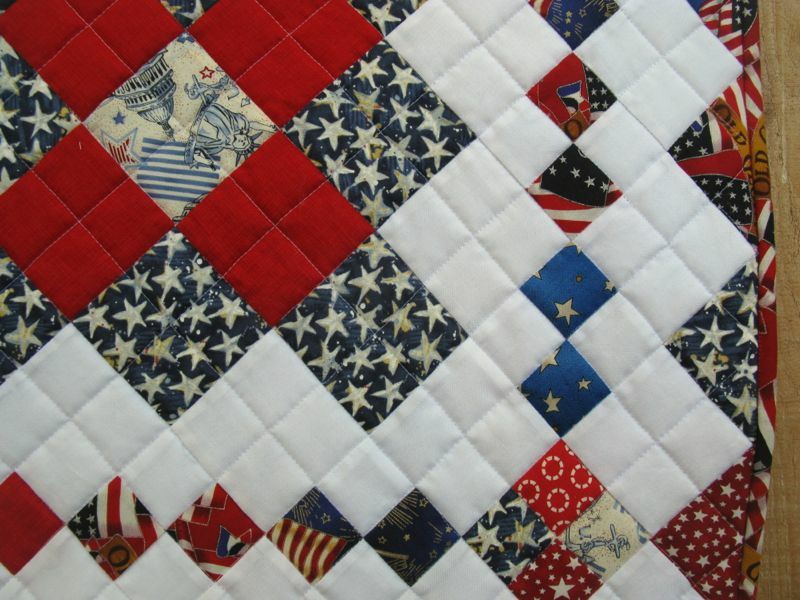 America Is A Tune: October Schnibbles Quilt | OccasionalPiece--Quilt! 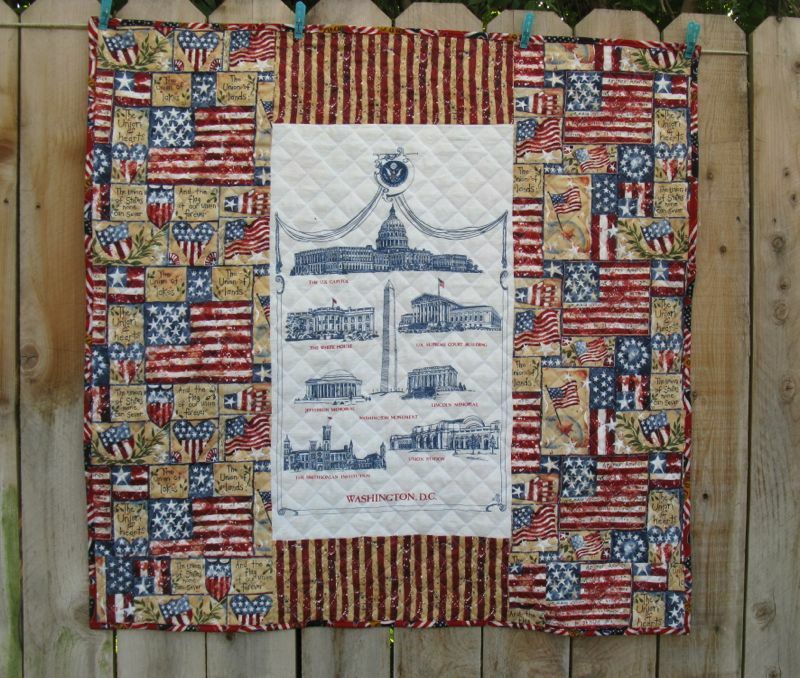 Posted on October 20, 2013 by Elizabeth E.
I was making this quilt all during the recent embarrassing shut-down of our country. It was embarrassing because I’d been thinking about the ideals that began our nation, and I felt that no matter what your political persuasion, the sacrifices of those early leaders would pale in comparison to the sacrifices being made by those now congregating in the halls of Congress. And perhaps because they made those sacrifices, maybe those early leaders recognized the fragility of the nation, and worked hard to get it going and keep it going. The title of this quilt is from Gerald Stanley Lee, a clergyman writing at the time of World War I, and I think it kind of expresses what I would hope we, as a county, could embrace again: working together. Okay, enough on that, but I am really happy the shut-down is over. So I cut the center “flower” blocks 3” square (finish at 2.5″). Then cut a bunch of 1 3/4″ squares and sewed them into a four-patch, which would finish at 3″ square, too. 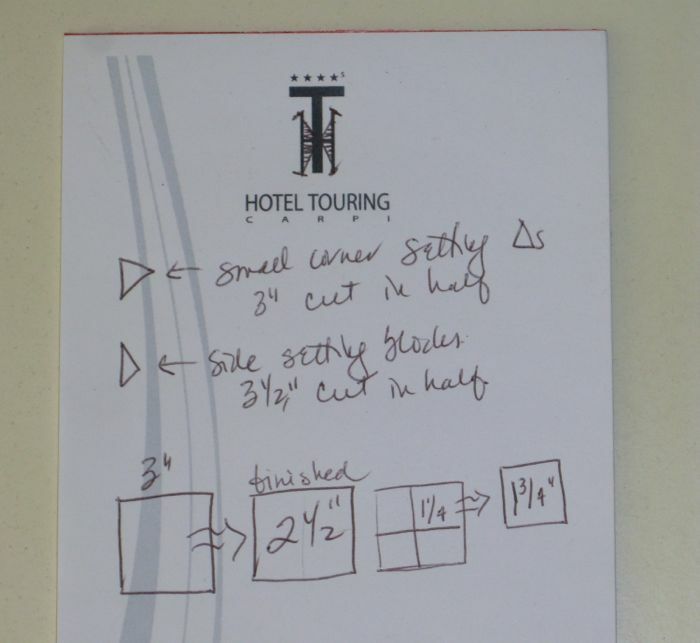 I randomly picked these measurements, and so also include how I constructed the side setting triangles and the corner triangles. And although it happened again: this pattern included no cutting instructions for those of us who don’t buy gobs of Moda pre-cuts, this brilliant design is all Carrie Nielson, from Miss Rosie’s Quilt Company, so get the pattern before you start. What prompted this was a visit from my son, who is a political animal–eats, drinks and sleeps politics. Somewhere in a chest of drawers out in the garage was a little T-shirt I’d bought for a grandchild at the Senate Office Building when we had our sabbatical in Washington DC. And when looking for that to give to him (so his daughter could wear it), I found this tea towel, with some of Washington DC’s landmarks. My favorite one, the World War II Memorial isn’t on here, nor is the World War I memorial, which is hidden off to the side of the Lincoln Reflecting Pool (on the left, as you face Mr. Lincoln). The backing fabric is an ancient fabric from Susan Winget. I’d been saving it for a patriotic quilt, and it now has found its home. I quilted it in a cross-hatch design, while listening to The Light Between Oceans, by M.I. Stedman. I have three hours to go and I’d better get going on quilting last month’s Schnibbles, so I can finish the book and talk to my mother about it. Love that quilt and as I’ve said before, I admire your tenacity with the small blocks. While I’ll endure “small” in paper piecing, I cannot do it on a Schnibbles for some reason. 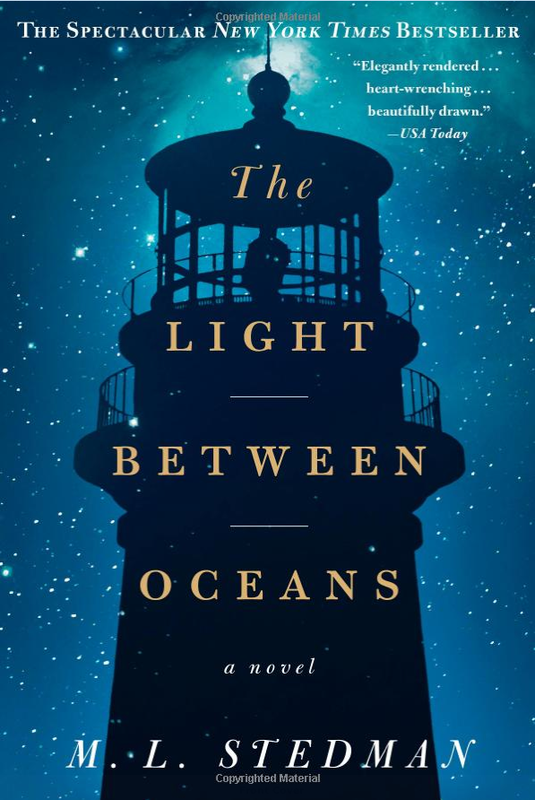 And now I’m intrigued by this book!!!! I am beginning to think you have a guardian angel of tea towels who hides them around your house for when you need them. Perfect! and Perfect timing! I agree about the tea towels. There always seems to be one that fits perfectly. This is a stunner once again! 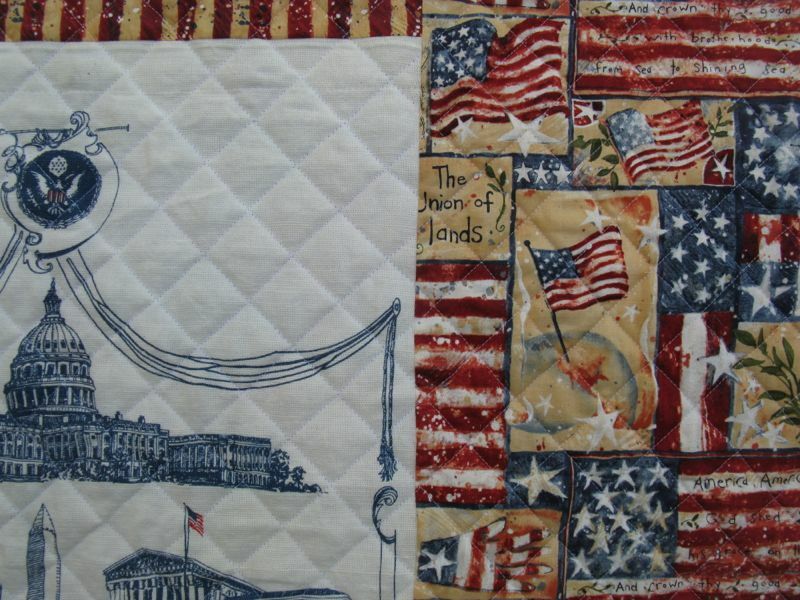 Makes you stand a little taller to see a patriotic quilt. Thanks for sharing. Awesome! What a clever backing too! 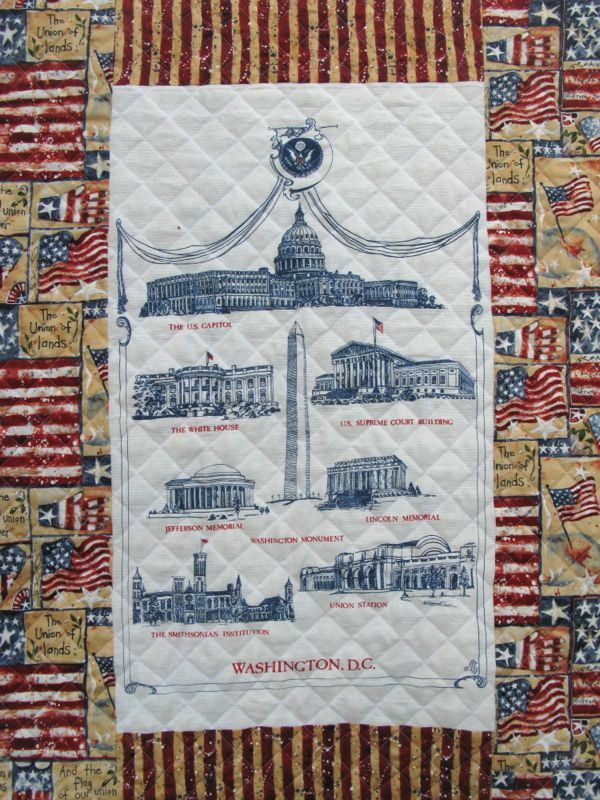 I love everything about this quilt–the pattern and fabrics, the wonderful title, and that awesome backing! 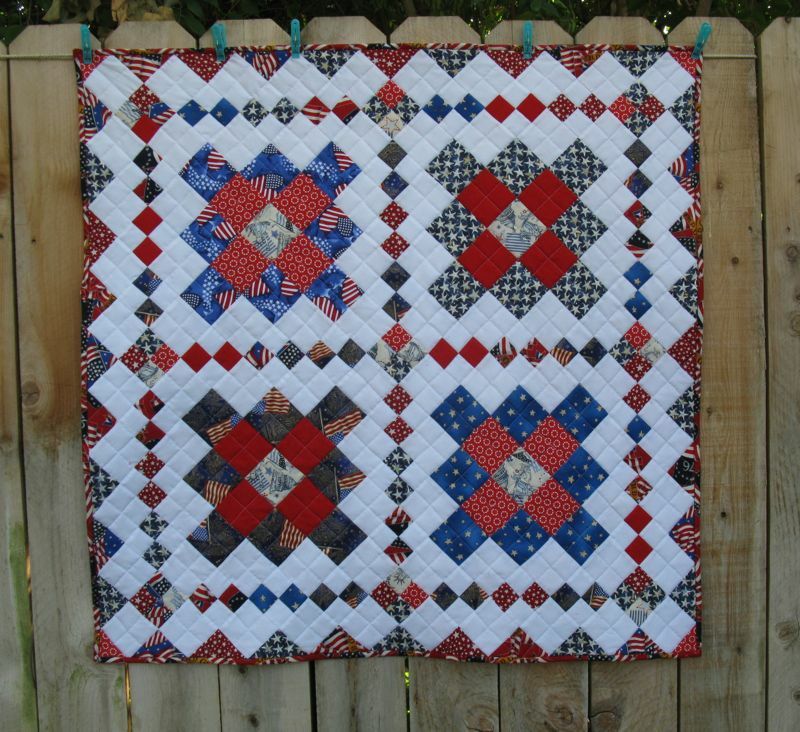 Very nice quilt 🙂 Love the patriotic fabrics! Pingback: Happy Fourth of July! | OccasionalPiece--Quilt!